At about four o'clock this morning we were woken by the sound of heavy, sustained gunfire coming from our roof. This wasn't just rain, it was a barrage of water and it came with a violent wind that shook Thor about so much, we all had thoughts about whether we might actually be flipped over. It was the kind of rain we used to get in DC sometimes and it was fun to watch, knowing it would be over in ten minutes or so. Last night though the storm kept picking up in intensity then falling away a little before whipping up again. It did this for more than an hour and it felt like the end of the summer. This morning, there were shaggy grey clouds over the mountaintops obscuring all but slivers of freshly washed blue sky. All the motorhomes in the campground were all sparkling clean from the rain, but the tent campers looked as if they had had better nights. The older couple on the beautiful yacht moored down from us, untied and slipped quietly down the fjord. We had noticed the American flag on the transom and sure enough it was registered in Cumberland, Maine. They've had quite a journey. The sun was in and out, but mostly in and we set a course south to one of Norway's only baronial estates. It would be a last Thing To Do before finding a ferry to take us back towards Bergen. It was, of course, a pretty drive winding along the fjord's edge with all the usual waterfalls boosted by the night's rain. At one point we actually crossed a bridge over the end of one enormous waterfall that was so close to the road it felt like it shouldn't actually be there - as if a dam had burst its banks. It all felt distinctly autumnal though, cool and cloudy with patches of sunshine that seemed to know they were fighting a losing battle. Even though its only the end of August, we've noticed people getting ready for winter with big sacks of logs being delivered to houses and all the plastic wrapped haybales being pulled in for storage. The Rosendal manor house was built in the 1660s by a Danish Aristocrat with pretensions. He actually wanted to be a Baron and despite the fact that the King didn't think his estate was big enough, he managed to get a Baronetcy on the condition that it would only remain in the family's hands as long as there were male heirs. The house is actually quite modest, and unusually for the region, built of stone as that is what the Danish aristocracy did. All the wood inside is painted to look like marble, including a vast oak spiral staircase that was constructed from a single tree. No photos allowed unfortunately Madam. The most interesting room was the one that had changed the least since the 17th century; its walls covered with French tapestry in dark reds and greens. There was a small bed and we were told that in those days the gentry slept sitting up, scared that the vile humours in their body would seep into their brains if they lay flat at night. The house had been changed a fair bit since then by subsequent owners who bought it when the original Baronetcy died with the last male heir. 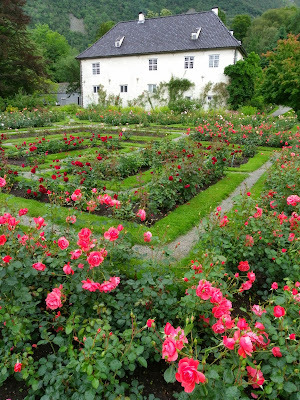 The old formal gardens had been opened up and are still very pretty with lots of roses. When the new owner's family finally died out in 1927, the whole lot was bequeathed to the University of Oslo, although our tour guide suggested that the man who had originally suggested the bequest had intended it to be for the University of Copenhagen, in the spirit of the original Baronetcy. Coming just after Norwegian independence (from Sweden) though, I imagine that idea wouldn't have had a great reception. From Rosendal, our southernmost point in Norway, we retraced our steps back up the coast a few K to Årsnes and the ferry terminal, where we are now. We are at the front of the queue with the ferry steaming in at a fair old pace under stormy skies. It is the Vikingen, registered in Bergen. We crossed the fjord with a wide view all around to areas under torrential rain, others under cloud and a few in sunshine, lit as if by searchlights. It was a hundred and twenty five kilometers to the campsite I'd found which is just twenty minutes or so from the airport. The ride took us first along a patched and twisting little fjordside road, past tiny harbours and farming villages. P and I both felt the scenery looked a lot like Maine. The rain came and went and we were treated to some stunning rainbows. It felt very much like our last ride though. After having headed north all the way from Rosendal, we finally turned west in Norheimsund and followed the signs for Bergen. Now it was a busy, fast road but still fairly rural and the campsite has views across to hills. We've been trying to finish our standby food, which meant a fairly eclectic supper of tomato pasta, potato salad, tinned fruit and yoghurt. Not perhaps a lifestyle diet, but it did the job. Tom has been breaking down his lego into ziplock bags, Philippa has been clearing up and I have been packing. Tomorrow we wake up in Thor for the last time. We are in Sundal, a lovely little place which reflects many of our experiences over the past few weeks. The three of us are sitting on a wooden jetty looking out over the Kvinnheradsfjord which is dark and glassy, its surface rippled only by the occasional leaping fish. To the left is a fishing dock with white clapboard buildings and a wooden-hulled fishing boat tied off for the night. To my right, shafts of light from the evening sun are slowly tracking up a steep green mountainside. Behind me, the sun has just lit up the top of a glacier, which is sending a river of blue-grey ice steeply down the mountainside. We really didn't think we would get this lucky tonight. It was a dullish sort of morning when we woke up and both Philippa and I were wondering how we could make the most of our penultimate day on the road. We've actually come south of Bergen in our attempts to pretend to ourselves that this holiday is going to keep on going. But we had no Big Thing planned and walking didn't particularly appeal without the promise of great views. So we mooched about and Tom did another practice English paper (oh the enthusiasm for THAT) and even though we were on the edge of one of Norway's great fjords - the Hardanger - there was a feeling of our journey going out with a whimper. Our Dutch neighbour had left Espelandsdalen Camping early, so we were the only ones there by the time we joined the twisting road that wound down towards Ulvik. As we went, we flushed clouds of little darting birds from low hedgerows full of pinky-purple Lady's Slipper. The old barns had roofs made from huge slabs of slate and it was utterly quiet. We saw not a soul. Ulvik was just about open but eerily deserted. We got a photocopy of the ferry timetable from the tourist office ("do you have 50 krona for the ink...?) and then got very lost trying to get to Kinsarvik, where the ferry leaves for Utne - one of the prettier villages at the junction of several fjords. Some way down the road out of Ulvik we passed an abandoned ferry terminal and assumed it to be Kinsarvik, so we abandoned our Kinsarvik ferry plans and put Kvanndal into the satnav, which also has a ferry to Utne. But then we got sucked into a tunnel and spat out onto a graceful new bridge which after some head-scratching we realised had taken us just up the road from Kinsarvik. "How long is the vehicle?" "Tickets for you and your lovely wife?" (from the back) "I'm NOT lovely!" Big smiles and on we went. The ferry was one of the smallest we have been on and just about the only other passengers were a bus-full of long-lens toting chinese people eating noodles they had brought with them. Utne was indeed a delightful little place, a string of wooden waterfront houses and a white-painted church. We found a carpark with a view to have our last pack of Lofoten's finest fish soup. Our food supplies are almost gone now and we shall miss that soup! A short walk from the ferry dock is Utne's folk museum which had displays of costumes in one hall, including wedding costumes which included head-dresses very similar to those used by the Sami people, which in turn are very similar to those used by Native Americans. 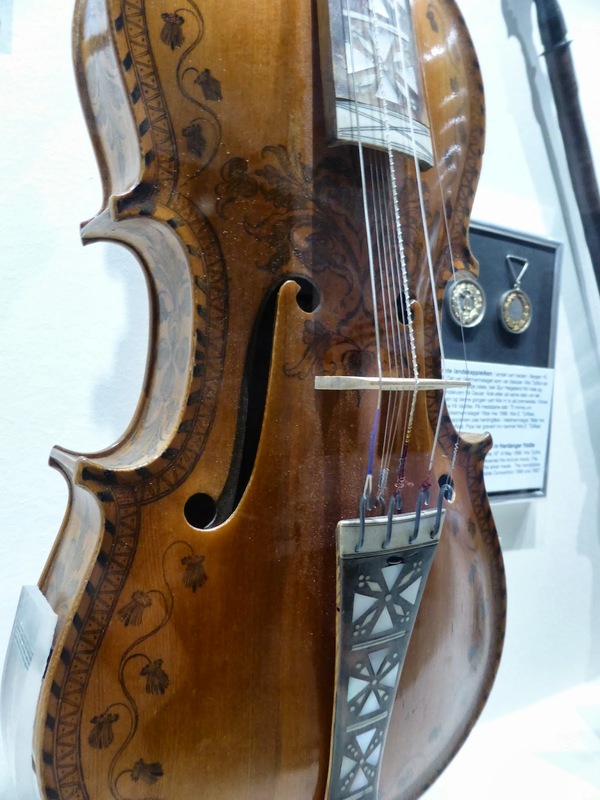 It also had an interesting display of Hardangar Fiddles, which have a second set of strings underneath the usual four and make an unusual, almost accordian-like sound. 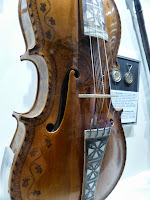 They also had some extraordinary primitive slim boxes with a single string which were played with a bow, and some long, slim birchwood trumpets used by shephards to communicate from mountain to mountain, and to scare away predators. Behind the museum was a great collection of old Norwegian buildings. The oldest was from the thirteenth century. It was a single room log house with a vent in the roof for the smoke from the raised fire pit in the centre of the room. The vent also provided the only light. There was a heavy stone floor and benches on three of the walls used for sitting and sleeping. At the back was a long wooden table and behind it a rack with spoons made from wood and horn. Everyone had their own and they all ate from the same bowl. Next to the bench on the back wall was a hatch which had a single function; it was for the removal of the dead. At the time, people believed that the souls of the dead would always try to return home, but only through the last door they had left the house from. So after the body was taken out through the hatch, it was closed and not used for anything else. It felt to me like we were looking at a house that would not have changed much since the viking era. There was also a small log cabin from the 1820s owned by one Gunnar Arnfinnson Årkol who was weakened by TB and no longer able to be a crofter. He'd tried all sorts of other occupations including bookkeeping, but discovered eventually that what he was really good at, was painting - and in particular, painting furniture with floral patterns. He became well known for his skill and his cottage had lots of little pictures on the wooden walls and furniture that he had painted. As we walked around the buildings the sun began to come out, finally lighting up the Hardangerfjord and its surrounding mountains. It put a spring back in all our steps and we made plans to head down the long sliver of Sornfjord to Odda where there was a reasonable-looking campsite. It was a perfect drive through the fjord country with pretty little buildings all along the water's edge of the kind we had just seen in the museum. The sun shining on the opposite bank made the red barns stand out like bright sparks against the green hillside. We passed fields of fruit trees and little stalls selling punnets of plums. It was a grand drive of about 40K down the length of the fjord. As we drew closer to Odda though the landscape changed. There were two big container ships anchored by an island which was completely full of some kind of production plant. A huge carbide factory was established nearby in 1908 and for a few decades Odda was something of an industrial mecca, but its heydey is long gone and today it has a gritty, ground-down feel overshadowed in parts by the giant concrete remnants of long-gone factories. That said, it still has plenty of characterful clapboard houses and its not hard to imagine Odda making a comeback as one of the more unusual destinations in fjordland. When we got to the campsite though it was a depressing collection of ratty caravans and people sitting around on benches smoking. P and I knew immediately we didn't want to stay there, but we hadn't seen anywhere on the way that looked like a good free-camping spot. On the other side of the mountain we knew there was another campsite in a more remote area, and thankfully there was also an eleven kilometer tunnel which would take us there. As soon as we came out of the tunnel mouth we knew we had made the right choice. It was like going through the back of the wardrobe and into Narnia, a brilliant stretch of fjord gleaming off into the sunset with mountains crowding in from either side. The view of the glacier was the icing on the cake and we pulled in and parked up. Its great to end the day feeling uplifted by Norway again. I suppose after yesterday anything would have been an anticlimax, so we took it easy. It was overcast when we got up - for the first time in more than a week. The smart little campground was emptying quickly. We took our time and the three of us used the campsite wifi to post photos on the blog, download the newspaper and research Tomb Raider for Nintendo. Honestly, Philippa is just nuts about that game. At about 11.30 we realised that we did actually have a ferry to catch and as the tourist season (you'll remember) is well and truly over, the schedule would probably be more limited. So we upped sticks and got back on the scenic 55 towards the ferry terminal at Hella. The narrow road hugs the edge of the Sognefjord, with a concrete guardrail on one side and a rock wall on the other, a situation which always makes my pulse race somewhat knowing the speed at which the big trucks take these roads. But the road ends at Hella so after an initial burst of traffic which had just got off the ferry, I had the road to myself for the next thirty kilometers or so. Its a road which on any other day would have been quite beautiful, but the flat light and misty cloud hid its best features, casting a grey light across the fjord and turning the mountains into ghostly silhouettes. We arrived at Hella exactly as the ferry to Vangsnes was about to leave. We paid the ticket lady, drove on and a minute later the boat was moving. Perfect. I went up to the top deck as the ferry got underway and met a Honduran biker called Luis. He had rented a motorbike in Oslo and was heading to Bergen and wanted to know how much further it was, as a closed tunnel the day before had forced him to take a beautiful but circuitous route through the mountains and put him a day behind schedule. He was an interesting chap who had flown all over the world to go biking; all through Central and South America of course, as well as China and various European countries. He was as blown away by Norway as we have been. When we were waiting to disembark in Vangsnes I had a quick look on the satnav and discovered it was 179K to Bergen. I called across the car deck to tell him and he came over. We shook hands and wished each other a good journey. In 1913 Vangsnes was a village with 258 inhabitants and no roads. But on July 31st that year up to ten thousand people including the Norwegian Prime Minister, descended on it for the unveiling of a ten and a half meter, fourteen ton bronze statue of Fridtjof the Viking, mounted on a twelve meter high rock plinth. It was a gift from Kaiser Wilhelm the Second who came to the Sognefjord for a few weeks every year on his yacht and enjoyed reading the Fridtjof Sagas to his guests. It is certainly imposing and makes you wonder how the people of Vangsnes felt about having this colossus towering over their farms on a whim of the Kaiser. Its a wonder too that it wasn't melted down for scrap when the nazis bombed several local towns thirty years later. But there it remains. And it is something to see in a little place which feels like it still hasn't got many more than 258 people living there. Vik, the next town came and went but from there the road started rising sharply up, and up, and up to the Vikafjell Plateau which is described in the Rough Guide as "forbidding". On an overcast day like this, the lumpy treeless mountains certainly look like they wouldn't suffer fools gladly. The patches of snow came almost up to the road and at the highest point, where the road is swallowed by a gaping tunnel, we got out to walk nervously along the old road. It follows the very edge of the mountain before it vanishes away, having slipped down the muntainside leaving bits of re-inforced steel barrier clinging rustily to the slope. Back down on the other side is Voss, which looks quite different from other towns we've seen having apparently been largely rebuilt since being bombed in WW2. The 13th century church has stone walls up to two meters thick and survived the bombing. We went to see inside it. The timber ceiling was painted in the 17th century with angels which get more numerous the closer you get to the nave. Voss has remade itself into a centre for mountain sports and as we had lunch at a great little cafe we watched a couple of people parasail down the mountain. Lunch was excellent - home cooked and nicely presented as always, but for the first time we found ourselves surrounded by English people. We felt undeservedly territorial. Having had Norway more or less to ourselves for the past month it was annoying to be suddenly confronted with hordes of our own countrymen all doing the same thing as us. Humph. They all left before us though so we could sort of pretend that they weren't there at all. It was reminder though - like the realisation that Bergen is just over 100k away - that we are getting towards the end of this trip. We are spinning it out by taking the slow route though, and we have left the fast E16 to head south to the villages at the eastern end of the Hardangerfjord. We are now just a few K away from Ulvik, at a campsite overlooking one of the skinny fingertips of the fjord. When we arrived, a sign at the office said the campsite was closed for the season, but a Dutchman came out of his little campervan to tell us that if we parked, the owner would come and collect some money from us later. Which indeed he has. All is quiet. T is drawing, I am writing this from a camp chair looking over the inlet and P has just knocked on Thor's window to say supper will be ready in two minutes. So we'd better go in. It rained on and off for much of the night but this morning the clouds were being whittled away by sunshine and the sky was soon completely blue. So the Glacier walk was on! I rang the glacier centre a couple of days ago and found that they had now stopped the group tours in which ten year olds are allowed to go, but if we had a private guide we could all get onto the ice. So, on the basis that this is not something you do every day, we coughed up for the private guide and met him by the lakeside just across from the Nigardsbreen "Nodule". 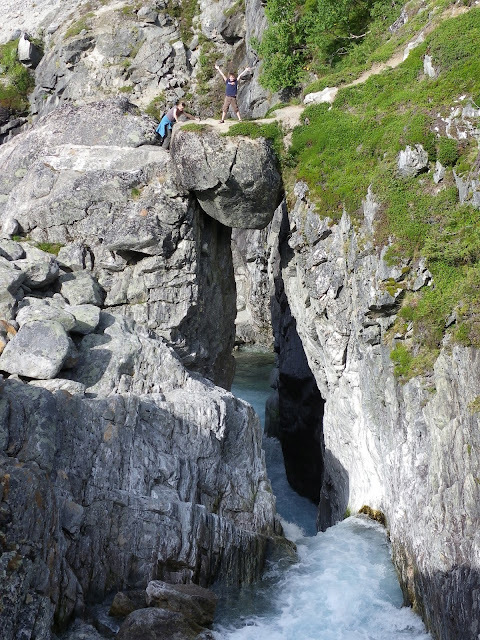 Our guide book insists that these rivers of ice that curl down the hillside from the Jostedalsbreen glacier above are called "nodules" but its the least convincing name for them imaginable and I haven't seen the term anywhere else so I'm going to ignore that terminology. Frånk (I'm guessing at the spelling but it's pronounced "fronk") was a sturdy sort of chap and initially fairly taciturn but when he started dishing out crampons, ice axes, harnesses and a helmet for Tom, we knew he was someone for whom actions spoke louder. He said he had been guiding people on the ice for twenty years, which almost certainly meant he was a teenager when he began. There is usually a small ferry to take you across the glacial lake to the foot of the glacier but Frånk told us "It is broken, so we will walk for an hour to the glacier". And that's what we did, hopping over rock worn smooth by the retreating ice, lugging all our kit and watching the tidal wave of ice get closer and closer. Its a lot bigger close up! Suddenly all those caves and cracks are revealed to be far bigger than people. The ice is a lot less white too. The further to the front the ice, the older it is and the more dust gathers on it. We all put on our harnesses, and strapped the crampons to our boots. Frånk explained about how to use the ice axes, and how to walk on the crampons: "Its important to trust the crampons - feet flat when walking". Then he roped us all together and off we went. Walking on a glacier is such an alien experience. Lower down it is as though it is composed of millions of ice cubes, each about the size of Tom's fist. It crunches and crackles underfoot as if you were walking on broken glass - or big diamonds. It was completely thrilling just to take a few steps. The whole glacier is a mass of tunnels and rivulets and streams and rivers running over, through and under it. You never really lose site of running water somewhere over its surface, and of course all around on the slopes of the mountain there are huge waterfalls created by the vast Jostedalsbreen glacier above the relatively small offshoot we were walking on. Frånk took us to deep blue holes with water crashing into them, echoing down the tunnel and vanishing out of site. We jumped over sinister blue crevasses, and climbed up through cliffs of ice formed by the pressure of the sloping sides of the valley. Thanks to the crampons it never really felt slippery and P and I would occasionally exchange "can you believe we are really doing this?!" glances. We climbed out of the crevasses and onto the wide flank of the glacier, looking down onto the lake below, and up onto the ferocious ice cliffs in a narrowing of the valley above us. Frånk said it would be possible to walk through them but would take days. He told us stories of the occasional accident that has taken place up there. Years ago a car with Italian plates had been found nearby apparently abandoned and they searched the glacier but found nothing. Several years later someone reported seeing two people sitting on the ice back to back and it turned out to be an Italian couple who had fallen into a crevasse and apparently sat back to back after being unable to get out. Eventually as the ice shifted, it brought them back to the surface. On the way down we found the bones of an Elk which had befallen the same fate and had popped up about eight years ago on the ice. In fact for the most part the glacier was extremely stable according to Frånk, who said most accidents happened on the rocky walk to the foot of the ice. We spent about three hours on the glacier, wending our way up it, down it, over and through it and it was truly awe-inspiring. At the end of it Frånk gathered our kit and walked back along the lakeshore, leaving us to enjoy the sunshine and the huge smooth rocks at the foot of the ice. The walk back to Thor - almost six hours after we had set out - seemed a lot longer than on the way out and we were all a bit crispy around the edges from the sun bouncing off the ice. We got the camping chairs out to sit and watch the view and plot our final few days of this trip. Then it was back onto the narrow road to Gaupne and onto the 55 again through what feels more like civilisation again. We are just across the fjord from Sogndal now at the neatest little campsite we have stayed at I think. It was strange to sleep though, without the white noise of a waterfall somewhere in the distance, and the thought of a glacier looming over us. The gas ran out last night. That meant the heating died and so did the fridge. We were all wrapped up and warm though and it was cold enough in Thor that I don't think the contents of the fridge suffered too much. It will chill down again properly once we start driving again and the fridge switches to electrical power. That one gas cylinder has lasted us all the way from day one in Sweden, which is fairly impressive. I've just pulled up the blinds and can see low cloud brushing the very top of the mountain across the road from us, but I can still see the glacier spilling down its flanks into shafts of sunshine. Tom has just emerged from his bunk where he has been reading. He pulled back the curtain and looked surprised to see me up. He has a bit of a shiner this morning after falling off a rock when he was running around outside Thor last night. He just caught an eyelid which immediately swelled up but we put some frozen vegetables on it and some arnica ("Thanks Granny Margaret"!) and it doesn't look too bad now - just a rather interesting shade of violet. P is reading in our bunk but I think its time I made us all some (cold) breakfast. Well, after the cold breakfast we set out back onto 55 heading south through the Sognefjell mountains under a morning sky with drifts of cloud and patches of sun. At the hamlet of Turtagrø we stopped and went into a hotel/info centre to try to find a walk recommended to us by a nice older gent at the tourist office in Lom. He was laughing with us about how nice it was travelling around Norway now that all the tourists had gone but then suddenly looked stricken as he realised that we too were tourists. "I am just joking of course" he said nervously. Obviously we are reporting him to the Norwegian tourist board. In what may well be one of his last dealings with a tourist he had told us there was a walk up to an old farm with delicious food near Turtagrø. The lady in Turtagrø looked blank when we asked about it though. I remembered that the farm had been built with stones carried up from the river by the farmer and she knew it instantly: "Fuglested!" she said, or perhaps it was a sneeze, anyway that sounded right and she sent us to the next place ten k down the road called Fortun. As we turned to go out, a trim elderly lady behind me smiled and said "It means fortune". The village of fortune sits in a wide green valley with sheer, forested mountains rising around it on all sides. P thought it looked Bavarian with its neat white wooden church and low-slung farmhouses. Our first stop had to be to find more gas otherwise the fridge would go off every time we stopped and there would be nothing to cook with. In a place as small as Fortun we didn't hold out much hope. We pulled into a scruffy Shell station with bits of car about the place and no sign of any gas facility. There was no-one at the counter and we almost pulled out again. We spotted a couple of mechanics wrestling with a Subaru; I asked them if they had camping gas and one of them took our cannister off to a shed, filled it and charged us the grand total of about forty quid for a month's worth of cooking, heating and fridge freezing. Bargain! He also had a bolt to replace one that I flipped into the engine bay and lost when I changed the headlight bulb in Mo-i-Rana. "Its no charge" he said with a smile. So yes, Fortun certainly lived upto its name for us, and it continued when we stopped at the hiker's car park and there was a drain for our grey water tank. How exciting can one village get?? We had been given varying accounts about how long it would take to get up to the old farmstead. The lady in Turtagrø said it would be an hour and a half, the former tourist information advisor in Lom said it was an hour and fifty minutes and the sign in the car park said it was two hours and very steep. It certainly was steep. It was like climbing stairs all the way and I am not exaggerating. We must be getting fitter though because after just an hour and twenty five minutes we were walking through a grassy field to a collection of turfed roofed buildings including a handsome stone farmhouse. It was built in 1830 by Sylfest Ormeli who apparently spent five years carrying the stones up from the river all the way to the field 630 meters above, before telling his wife that he planned to build a farm there. Again, these Norwegians are different from the rest of us. Apparently his kids walked up and down the mountain to school in Fortun every day. It was a nice enough spot and we had our picnic enjoying the gorgeous views down to Lustrafjord at the end of the valley. You can stay in the buildings now and although they were closed up, we found an open door into one and admired the old wooden floors, worn down between the knots. There was no coffee and cake unfortunately as the tourist season is now well and truly over as we were told by a former tourist board employee. Going down was a lot quicker and we grazed on the raspberries growing wild by the path. Then we grazed on ice-cream at the co-op by the car park in what was now hot sunshine. We climbed back into Thor with his fridge now icy cold again and got back on the road, stopping five minutes on at Skjelden on the tip of Lustrafjord. It was too lovely to miss and Tom was determined to swim in the blue water despite the fact that it was utterly freezing. He went in several times though, gasping with the shock of it and coming straight back out onto the warm wood of the pontoon. On then down 55 and our wild mountain road had now become a gorgeous rural byway, hugging the fjord on a skinny little road that required close attention when people came the other way. It was very pretty, with bright red boats floating in the impossibly turquoise water, and enormous stone barns and ancient clapboard farmhouses on the shore. At Gaupne we turned right and followed a cobalt blue river up towards the Nigardsbreen glacier arm. We are the only occupants of a funny little time-warp campsite just down the road from the glacier centre. The elderly lady who runs it takes only cash and sells trolls next to the cash register which she has clearly knitted herself. First time I've seen a knitted cash register. We are hoping to go onto the glacier tomorrow but rain has been pattering on the roof this evening and we will have to wait and see what the sky is doing when we wake up. As in "Somewhere, over the rainbow, weigh a pie...". We have just crossed the highest point on the road from Lom to Sogndal - 1400 meters or so, and have parked in a levelled off area by the road. Across from us is a broad flank of the Jostedalsbreen glacier, shooting white waterfalls into one of the many blue-grey glacial lakes at its feet. Its a grand spot with only the occasional passing car. We've been sitting outside in the evening sunshine, nursing the last of our gin and eating cashew nuts. Its not exactly warm out there - the cool breeze off the glacier sees to that - but it is beautiful and very peaceful. Our morning started much the same way. After breakfast we found the start of a couple of hiking trails and discovered from a noticeboard that we had spent the night in the Breheimen National Park. We had intended to have a twenty minute walk, but there was a 3.5K trail to a natural rock bridge which seemed too good to miss in the warm sunshine. Inevitably, it was steep and we were all puffing after ten minutes, but eventually we came to a small gorge with a giant boulder suspended over the water, wedged between the two sides of the crevice. Tom hopped across and would probably have done handstands on the boulder given half a chance. P and I were a little more circumspect. The path on the other side skirted some ancient farms on land inhabited by farmers for more than a thousand years according to the blurb on the noticeboard. Our twenty minute walk ended up being ninety minutes and was a marvellous start to the day. The road to Lom is fast and the scenery, gentle. The mountains are wide and rounded rather than tall and the valley bottom is full of prosperous looking farms. Its interesting to see several generations of farmhouse and barns on the same plot. Often, in the middle will be the old turf-roofed house, its timbers now bleached grey. Around it will be small grey-timbered barns with mossy roofs, sometimes sagging somewhat. Then, very close by - perhaps across a courtyard - will be the new, bigger, farmhouse and barns in dark timber. Most of the rural buildings here are brown and black rather than red - quite a change from northern Norway. In Lom we stopped for lunch in the car park of an ancient stave church. It was lovely from the outside, but inside it was extraordinary; a great stack of carved timber reaching into a dark roof. There were bits of colour here and there and its thought the whole interior could have been painted red. It was built in 1158 and although the community was Christian, they also put dragons heads on the church roof to ward off evil spirits. I love those remnants of ancient beliefs that lingered on in parallel with the new religion. The docent was a young German guy and as we were the only people in the church we monopolised him. He was terrific, using a torch to point out patches of graffitti written in runes. One phrase was written high on the wall and said something like "I have been higher in this church than anyone else" or the docent said it could also have been "I have done more to this church than anyone else". He said when the vikings invented runic script it was regarded as magic and only really used to write words on swords or important stones. Later though it became widely used and he said they had found a wooden rod under the church floor in which a man had proposed to a woman in the congregation. He also told us of another stick found in Bergen which simply said "your wife wants you home now". The first text message? We spent much longer in Lom than we planned. Its a nice little mountain town - apparently the driest in Norway - and has a rather good water sculpture in its central square which echoes the aqueducts the farmers built to bring water down the mountainsides. Lom is also the start of the scenic route south to Sogndal, passing first through countryside and buildings that feel a bit like the Swiss alps, all tiny farms and glossy brown cows. But then the road starts to climb and soon we were in the Big Mountains again with the white wave of the Jostedalsbreen glacier breaking over their high ridges. We stopped a couple of times to get out and soak it all in, despite the chill wind. We stopped too a mile or so back to go up to a patch of snow a couple of hundred meters from the road. P and T had a mini snowball fight. We had intended to get a bit further tonight but when we saw the big space with a view over to the glacier, we couldnt resist. Its going to be cold tonight; the wind is whistling around Thor and we are almost out of gas for heating so we shall wrap up. Its exciting though to imagine ourselves all alone in this vast mountainscape.